Chris Wants a POS That Means Business. Chris owns a café. He’s about ready to choose a new POS. He’s narrowed it down to two. Both have the POS features he needs. One also has Point Of Marketing® (POM) built in. Best of all... Chris never needs to run database reports, download customer lists or manage a bunch of disconnected email, social, mobile and review sites (this makes Chris very happy). His marketing is in one spot. All connected. All working together. Automatically. Chris never lifts a finger. Chris clearly sees that the extra cash generated by his Point Of Marketing® platform will completely pay for his POS… and fatten his bank account for years to come. Choosing you has just become very easy. Fact: Yesterday’s simple “loyalty” programs are obsolete and merchants know it. Mercury Payment Systems has even pulled theirs off the market due to lack of interest. Merchants are demanding more from their POS investment than ever before… and their choices are endless. Oracle just spent $5.3 Billion to be where you can be tomorrow. That's how much they paid for Micros Systems. Why? Oracle already has the cloud marketing solutions dialed in. Now they have the POS. This is a confident bet on their end that POS + Digital Marketing = profits. 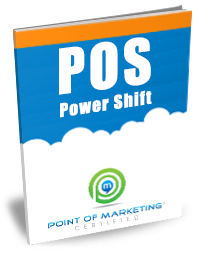 Our POS Power Shift Report shows you how a POS costing thousands of dollars will make more financial sense to a merchant than any “free” POS.